Sous vide cooking can result in some of the most delicious foods you have ever tasted! That’s why you need a high-quality, sous vide cooker that gives you total control over your food. Well, the Anova Precision Cooker does just that, and more! 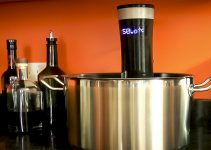 The first thing that we’ll discuss is how this amazing Anova cooker uses your own kitchen as an accessory to cook the perfect sous vide foods. Sous vide requires perfect precision and this unit is about the easiest way to get that. You simply attach it to any medium pot and then attach a plastic bag with your food to the side of the pot immersed in the water. The cooker will circulate the water and cook your food to the perfect temperature. The Anova Precision Cooker will clip to nearly any pot that you have in your home; although it’s preferable that the pot is at least medium size or larger. You want to ensure that the Anova is submerged as much as possible, like in the picture to the right. Imagine being able to cook restaurant quality food right in your own kitchen. Create the perfect steaks, vegetables or any other food that you want to serve and impress your friends with how amazing they taste. Cooking with the Anova Precision Cooker is the only way to get food that feels like it was prepared in a five-star restaurant by a world-famous chef. Let’s discuss the advantages of this product. Anova, as a brand, makes really high-quality merchandise and the Precision Cooker is no exception. In fact, it’s the rule! The main advantage of the Anova Precision Cooker is how well it works, cooking food evenly from one edge to the other, perfectly and evenly cooked through every square inch. With frying or baking or any other cooking method, the temperature varies all over the place, with some parts undercooked and some parts overcooked. This is partly because it can be difficult to determine exactly when food is at the perfect temperature and partly because cooking methods like frying are impossible to make food cook evenly. How Anova works is by circulating the water in the pot and keeping it at the exact same temperature all the way through. Then it determines when your food has reached the desired temperature and lets you know so that you can remove it and eat it. This works for everything including meat, fish, veggies, desserts and more. 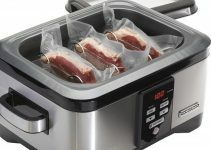 You just immerse your food in a vacuum sealed sous vide bag or a glass jar and set your temperature. The great thing is, you can use the simple interface on the cooker itself, but it gets much more powerful when you connect it to the Anova app. The app has plenty of recipes for you to choose from and you can set your temperature, check on your food and be alerted when it is done. You just need to connect the cooker to your Wi-Fi network and download the app, and then sync the two devices together. The bottom line is that this makes sous vide cooking even easier. This is a quality product that will allow you to cook using the same methods that some of the best chefs in the world use to create the most amazing, mouth-watering meals, from steaks to fish to chicken, and including vegetables, soups and more. While this is an amazing product, but there are still a couple of disadvantages that you need to be aware of. If you plan on hooking up your Anova to WiFi, then you need to make sure that your Wi-Fi router can broadcast on 2.4 Ghz in order to connect it properly. That will likely no longer be an issue as the newer routers become more prevalent. In fact, nearly every router made after 2002 broadcasts at 2.4 Ghz. If you’re not the most technologically inclined person, then it may be difficult to get the unit to sync up to your app at first, and it may take a few tries to get it going. Plus, the app itself isn’t that easy to use. There isn’t any integration with Amazon Echo and the features that are there are a little difficult to get used to using at first. 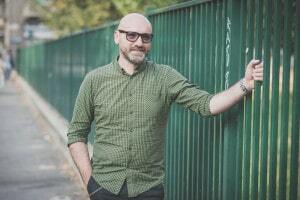 You may have to look online to find out how to use your app properly. If you’re looking for something with a bit less power, but from the same quality company, check out the Anova Nano. 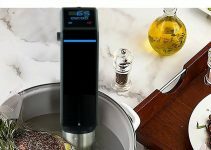 The Anova Precision Cooker is a really high-quality sous vide machine and while you will like using it, you will love the food that it cooks even more. With the smart technology that is embedded in the cooker and the way it makes cooking sous vide truly easy each and every time, this is definitely worth the price. You’ll love being able to make perfectly cooked meat, veggies, soups and desserts whenever you want, using your own pots and pans and a glass jar or sealed plastic bag. Grab yours today; you most definitely won’t regret it! Not what you’re looking for? 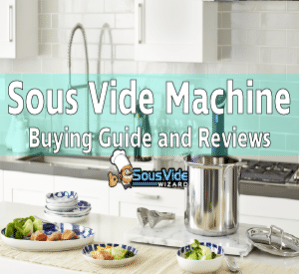 Head on over to our super comprehensive article on the very best sous vide machines! When did the Anova get a spec bump to 900 watts? Is there much benefit to the new version? Anova bumped the Precision Cooker to 900 watts when they released the WiFi + Bluetooth version. The main benefit is that it’s going to heat the water much faster.